The Park Headquarters is approximately 160 km away from Ho Chi Minh City (HCMC), from where it is usually accessed - via the main road to Da Lat (route 20). Exit HCMC on route 1A and pass through the conurbation of Bien Hoa, then fork left onto route 20 at Dau Giay. After approximately 70 km, turn left at Tan Phu, from where the Park is signposted. Having passed a couple of hamlets (Ap) proceed approximately 13 km (before reaching Talai) and turn right at Phu Lap. 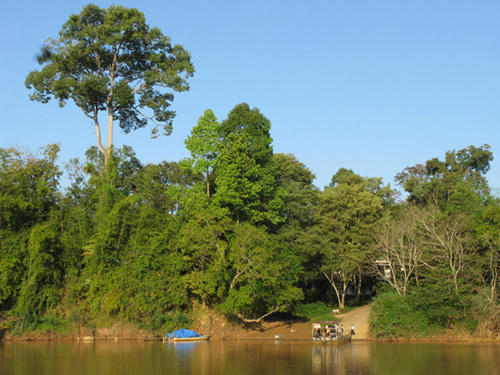 Turn left at the Nui Tuong junction, then bear right to follow the river until you reach Nam Cat Tien Hamlet (AP 5). Turn left at the T junction and the ferry crossing into the park (as appears below) is after less than 1 km. Alternatively, for travellers from Da Lat and the north, there is a minor road leading to Nam Cat Tien, which starts with a right turn (currently not signposted) after having passed through the centre of Ma Da Gui town southbound along route 20. After approximately 6 km, turn right then pass through AP 6 after a further 2 km. A rather pot-holed road continues for about 7 km more before reaching Nam Cat Tien Hamlet, where you continue straight on to the ferry crossing, after less than 1 km. 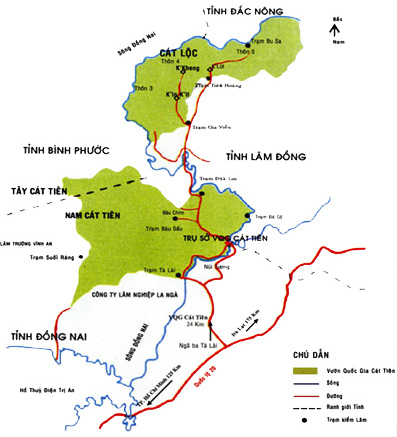 Map: showing the two sectors of the park (most visitors go to the southern part: Nam Cat Tien) and access from Ho Chi Minh City via Route 20. Click here for Forest Floor Lodge (sponsored link to separate site).